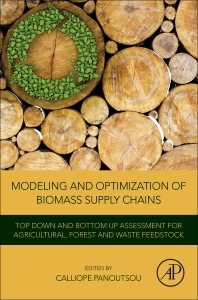 Modeling and Optimization of Biomass Supply Chains: Top Down and Bottom Up Assessment for Agricultural, Forest and Waste Feedstock provides scientific evidence for assessing biomass supply and logistics, placing emphasis on methods, modeling capacities, large data collection, processing and storage. The information presented builds on recent relevant research work from the Biomass Futures, Biomass Policies and S2Biom projects. In addition to technical issues, the book covers the economic, social and environmental aspects with direct implications on biomass availability. Its chapters offer an overview of methodologies for assessing and modeling supply, biomass quality and requirements for different conversion processes, logistics and demand for biobased sectors. Case studies from the projects that inspire the book present practical examples of the implementation of these methodologies. The authors also compare methodologies for different regions, including Europe and the U.S. Biomass feedstock-specific chapters address the relevant elements for forest, agriculture, biowastes, post-consumer wood and non-food crops. Engineers in the bioenergy sector, as well as researchers and graduate students will find this book to be a very useful resource when working on optimization and modeling of biomass supply chains. For energy policymakers, analysts and consultants, the book provides consistent and technically sound projections for policy and market development decisions. Engineers researchers and graduate students in the bioenergy field working on modelling and optimization of biomass supply chains. Energy policy makers, analysts and consultants. Calliope Panoutsou is a Senior Research Fellow and a member of the Bioenergy Group within the Centre for Environmental Policy (Imperial College London) and is also the Chair of the EBTP Working Group on Biomass availability and supply within the European Biofuels Technology Platform.